The Inca Trail tours are an exciting, high-mountain experience which climbs up to 4,200m, passing glacial peaks and descending into lush green forests above the clouds. There are many well-preserved ruins along the way. The Inca Trail is an exciting, high-mountain experience which climbs up to 4,200m, passing glacial peaks and descending into lush green forests above the clouds. There are many well-preserved ruins along the way. 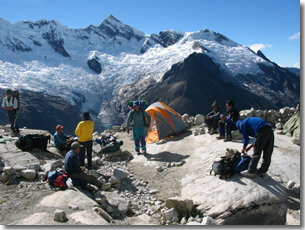 In the Cusco district, ascents on the mountains of Salkantay (6,271m) and Ausangate (6,384m), in the Cordilleras Vilcabamba and Vilcanota respectively, are made by a few groups each year. However, most of the climbs are technically difficult and there are very few opportunities for inexperienced climbers. give cult to them, their "apus" or protector hills; while, hundreds of men and women coming from all over the world, make an effort when climbing a mountain trying to reach their summits that seem to be unconquerable. In the Peruvian Andes, in the morning there is sunshine but the air is cool, like in spring; after midday the sun heats up, and one often has to take to the shade, as during the as during the summer ; in the afternoon , the clouds that have gathered all morning long begin to cover the sun, and it feels like autumn; when the skies are completely overcast, it becomes so cold that it feels like winter. All serious expeditions should be planned well in advance with June to September being the best months to make an attempt on a summit.